I requested that you include Miiverse20 functionality in SUPER MARIO 3D WORLD, and that led to something a little different.20. Miiverse: A network service, integrated with Wii U at the system level, that allows people all over the world to connect through their Mii characters and more fully enjoy video games. People can interact by sharing their thoughts in the plazas of their favourite games and by posting handwritten illustrations and comments. You mean the stamps for use in Miiverse ( stamp 1 , stamp 2 , stamp 3 , stamp 4 , stamp 5 , stamp 6 , stamp 7 ). You can post to Miiverse simply by using a stamp with the face of various Mario character on it. The stamps are hidden in the courses in hard to reach places. We had always wanted to do something with Miiverse, and I tried posting, but the world is full of people who can draw well. I can’t draw, so I couldn’t get into it. I understand. That’s a big difference between the two of us who are from a programming background and can’t draw, and people like Miyamoto-san and Koizumi-san, who can draw really well. So as I was programming, I was looking for a way to solve that. Then one day I was looking at some materials, and a line drawing of Mario caught my eye. I wondered if I could use it and tried plugging in the graphics data for display in Miiverse. It came out pretty well, and the development staff liked it. It resonates with people who can’t draw. Right. You can really get something across just by stamping and writing a few words . The whole impression changes simply by adding a little illustration. I thought it would fly, so I consulted the Miiverse team and we thought that since we had it, it should be for use in other games, not just SUPER MARIO 3D WORLD, and they implemented it. By the way, stamps will be available in Animal Crossing Plaza21, which is available as a free download, by the time this interview goes live.21. Animal Crossing Plaza: Downloadable software currently available from Nintendo eShop on Wii U. Players can expand their Animal Crossing experience by posting Animal Crossing: New Leaf moments and learn about new characters and in-game tips. For more details please visit the gamepage. Using the stamps is like Mario Paint22. You can write over things, erase, and fix parts.22. Mario Paint: Drawing tool software released for the Super NES in Japan in July 1992, and in Europe in December 1992. So instead of just writing in balloons, you can use it various ways, like by adding things by hand to the stamp illustration. (to Hayashida-san) How many stamps are there in total? Over 80. Some are rare ones that you get deep in the second half, so you should definitely post them to brag! And there are new kinds of gameplay that you can enjoy by connecting to the Internet. I requested that you include Miiverse 20 functionality in SUPER MARIO 3D WORLD, and that led to something a little different. 20. Ghost Mii character . This time, Mario goes to the Sprixie Kingdom to rescue the Sprixie Princess. There, your Mii character or the Mii characters of other people online show up as Sprixies. When you clear a course, the ghost of the person who cleared it will replay through that gameplay. You can see other people’s actions. There are Mii characters racing along on all fours, or they’ll pop out of places that looked empty. Yeah. But that’s your clue that something might be there. Ah, right. The Mii characters can serve as a reference for strategies to beat the course. It’s even fun just to watch them. For example, if there’s a cliff with a Mii character wandering around in front of it, you realise that person is hesitating over something. This is when we were working on the game, but when a new object was added, everyone would go check on it. I could see their Mii characters moving around those places with changes and checking it out. You can tell they were doing their jobs! Also a fast Ghost Mii will appear – the ghost of another player whose clear time is just a little faster than yours. So you can learn from the playing of somebody a little better than you are. That’s true. Another purpose is that sometimes that ghost has a gift, so if you chase it and take the gift, you get something. By the way, how did you arrive at the title of SUPER MARIO 3D WORLD? I heard that it was pointed out that including “3D” could be confusing since it isn’t stereoscopic 3D. Yeah. But the team had a strong desire from the very start to call it “3D World”. 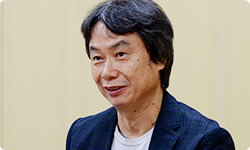 In the session of “Iwata Asks” about SUPER MARIO 3D LAND, Hayashida-san explained the concept of that game by talking about the missing link between 2D Mario and 3D Mario. SUPER MARIO 3D LAND was a 3D Super Mario game with the strengths of 2D Super Mario, which anyone can play. This time, we aimed to accompany that on a home console, so when I thought about the history of Super Mario, I realised that the name “Land” was for handhelds and “World” for home consoles. Some opinions against it arose along the way, and there was a time when it looked like it wouldn’t fly. 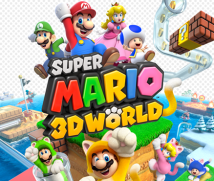 But it’s a name with a lot of thought behind it that suggests anyone can feel easy playing the game and that it’s a culmination of all the fun of a 3D Super Mario game, so the name had to be SUPER MARIO 3D WORLD, and in the end that’s what it is. The name “World” is one I became familiar with in my days gaming before becoming a developer, so when we decided on that, I was deeply moved, as well as a little nervous. As if getting the jersey number three on the Giants23?23. 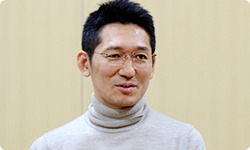 The jersey number three on the Giants: Number three is the retired number of Shigeo Nagashima, a professional baseball player who played for the Yomiuri Giants.